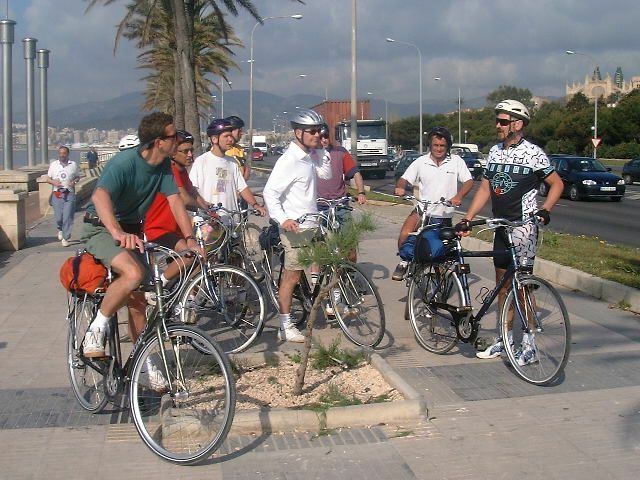 This was the 18th year for the Mallorca cycling week and the first to be held in the autumn. This had freed up the Spring and we went to Italy, to Riccione on the Adriatic coast, near Rimini for a joint walking and cycling week. 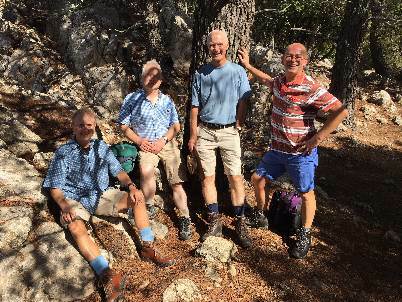 For Mallorca this year we had also managed to tempt a number of walking members as well, please see their own report below. It may have been October but Mallorca was hot. We had some totally sunny days but with cloud on others, plus a little rain, most of which was overnight. There was always a background warmth, so the warm clothes were never used. Unlike the spring the beach was an attraction after the ride, to either catch the sun or swim in the sea. Indeed the resort was still very busy with sun seekers along with lots of cyclists, if not at this time of year the racing groups. We were a group of 20 cyclists quite a spread of ability, but with plenty of flexibility we formed two groups most days. Some days we set out all together to divide later in the ride, on other days we did different routes. 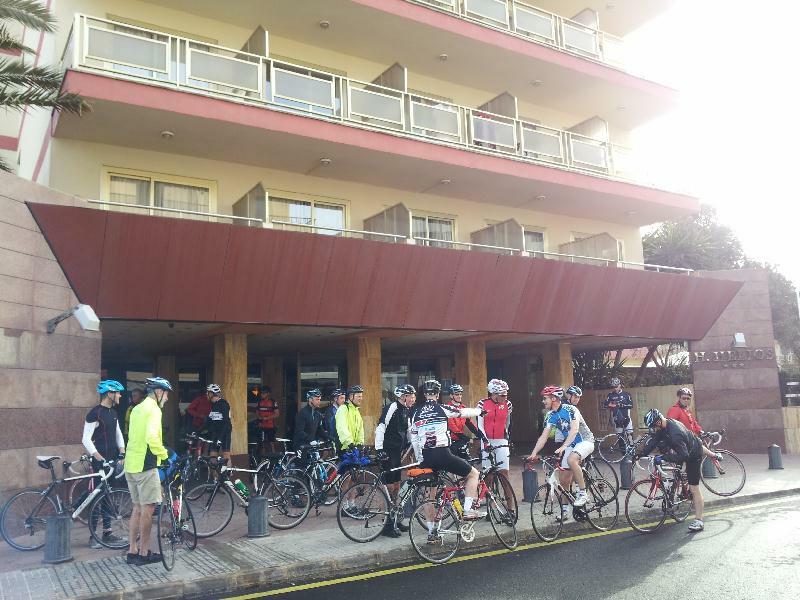 We started the week on Sunday, once we had all collected our bikes, with a joint ride through the villages behind the resort, picking up a quite service road that gently climbed to the small town of Algaida for a refreshment break. 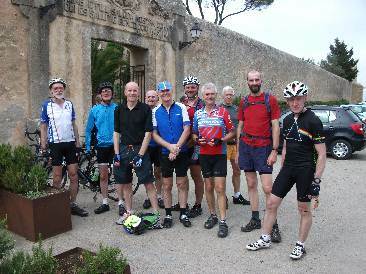 One group then took the flatter cycle route around the mountain to Llucmajor before returning to the hotel while the other group took an indirect route to the village of Randa with everyone ready for the climb up to the monastery of Cura. Once there we took in all the stunning views right across the island coast to coast. We then proceeded also to Llucmajor and back to the hotel. 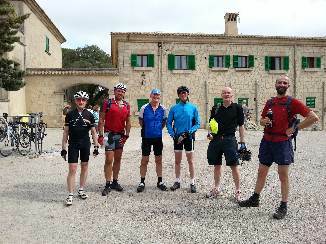 Tuesday we all proceeded to S’Arenal and then eastwards along the quiet lanes south of Llucmajor. Dividing so one group proceeded to Sa Rapita, past the famous "thatched" restaurant and Sa Torre Hilton, back along the coast road to S'Arenal. The other group went on to quaint old walled town of Santany for a bit of lunch before returning. Wednesday was the so-called rest day, so some took a ride to the col de Claret and Valldemossa and some cycled along the coast to Palma Nova. 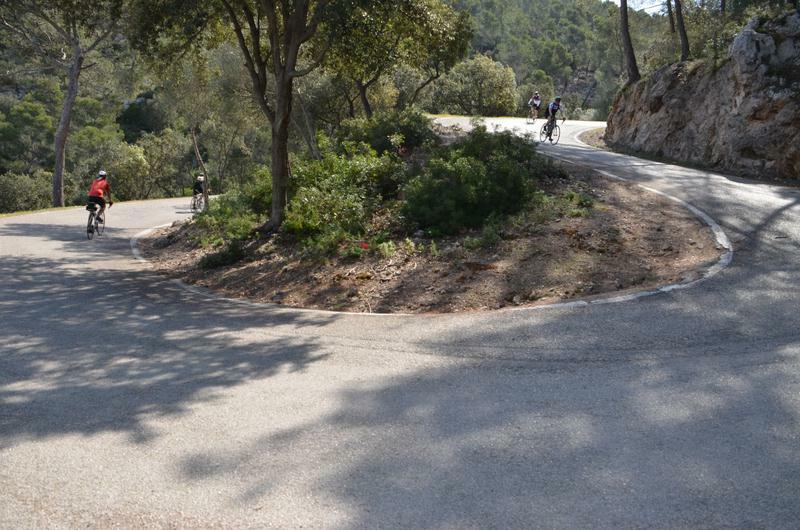 Thursday was the three hills ride, into Palma and over the Col de Creu to Calvia then the second climb to the hill village of Galilea then down to Puigpunyent before the Col des Grau and to Espories and home. 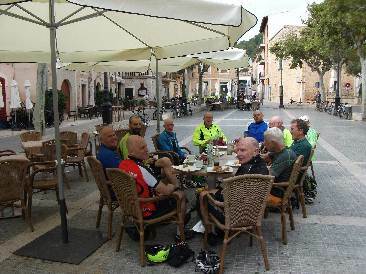 Friday, we set out all together to split near Llucmajor, with one group continuing to the town then the quite lanes to that famous "thatched" restaurant, back via Sa Torre and coast road. The other group going on to Algaida for coffee before proceeding to Sineu, which is right in the middle of the island. Then returning via Sant Joan, Montuiri and Casa Blanca. 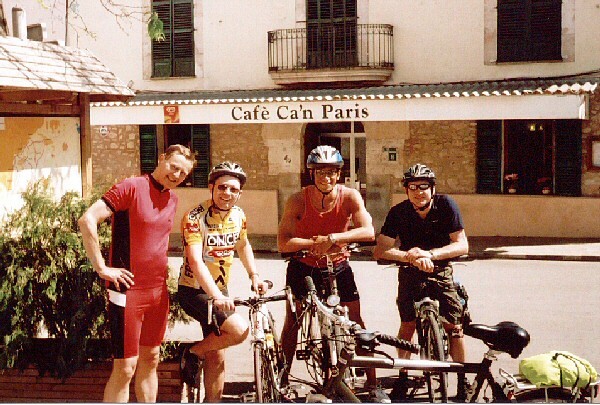 Saturday all our plans went wrong as we all got caught up in the bike race, which was part of the Palma Marathon. 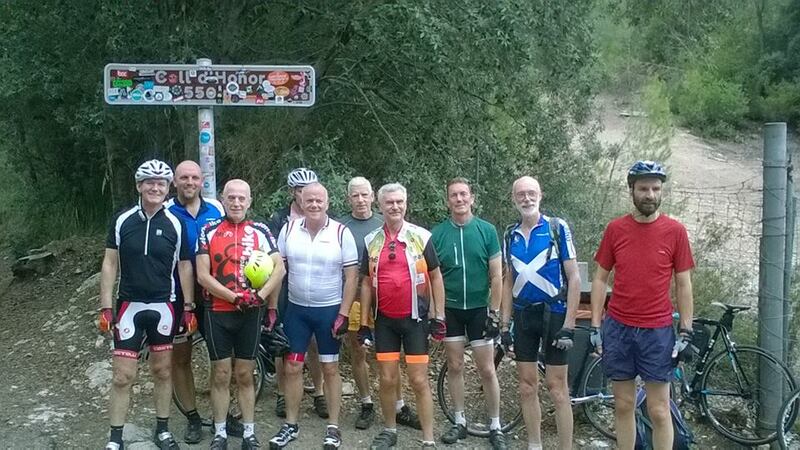 One group had planned to do the major five hills along part of the north coast but finished up back at Valldemossa. The other group having set out along the coast to Santa Ponca having planned the return via the Col de Creu finished up returning by the coast route. There are so many more routes than days so we will be returning next year in October. We already have the offer from the hotel and arrangements for the bike hire to cover the different bikes required. 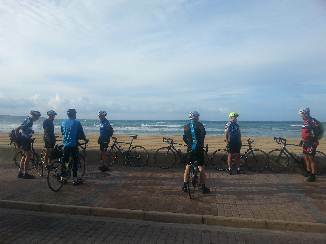 Up to 9 walkers joined the cyclists for this Octobers' joint trip to Mallorca, staying at the Hotel Helios in Can Pastilla which is about 8 km East along the Bay of Palma: Excellent 3* hotel across the road from a wide sandy beach and frequent buses into Palma and further along the bay. Sunday was an easy 12km stroll along the beach front walk & cycle path to Palma City. Passing underneath the landing approach for a surprisingly busy airport, marina and then the enormous Palma Cathedral comes into view and the city itself, quite large at over 400,000 resident population. The city walls are from late Moorish period (about 1200) with museums and a palace for the Spanish Royal Family to use. Lots of interesting streets and alleys too. Monday was a trip on the heritage narrow gauge railway from Palma about 20km north to the stunning old town of Soller. The now electrified line twists and turns through the countryside and has a 10 minute photo opportunity stop overlooking Stoller before the decent to town. We took a well marked path for about 6km down to the Port of Soller, passing villas, oranges and many olive groves Later got the narrow gauge tram (with open ended carriage riding if one wishes) back up to Soller. A very "touristy" day out but very spectacular. Tuesday. A few walked further along Palma Bay and swam in a crystal clear warm bay at Cala Brava. Later on a quite fierce squally storm passed along the inverted U shape bay. A drenching if caught in it! Wednesday. Buses up to the very charming town of Deia then a 12km walk down and up valleys to Soller. Again many olive and other fruit groves, as well as more shaded woods. Good quality path mostly. We chanced upon a converted farmhouse café for a welcome glass of fresh juice. Return "country" buses were operating a reduced service today as Spain's national holiday and were completely full when we tried to board. As was the heritage train. So we got taxis back to the hotel, quite reasonable at 55ish Euros for 4 people. Friday. 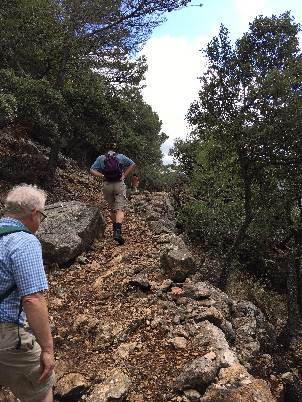 A tough walk from Valldemossa to Deia. About 12km but 600metre plus of assents. The original path up has been restricted now due to soil erosion so we were given a leaflet and instructions for the mostly wooded upwards trail from a friendly park ranger. After a most stunning view over Palma bay we continued past a Hermit's Cave and ancient bread oven to the Archduke's Trail which is part of the Tramuntana Mountains' long distance trail. About 1000m above sea level now. At the very most exposed top we were subjected again to a 20 minute short but sharp squally storm with cloud racing over us and small hail stones. Our waterproofs and sturdy boots were tested today. Decent into Deia was long and ziz-zag on a quite rocky path down the valley. Bus returns again proved very difficult so we cut our losses and got taxis again. About 6 1/2 hour walk today. Saturday was very blue and sunny so I spent the entire day pool & sea swimming and sunning myself!